We love making videos that inform and entertain. We specialize in video classes, promotions, and explainer videos. We've even made full corporate commercials. We engage you, our client to make every finished product unique and perfect for you. 1) We focus on pre-production, so all the details are in place before the cameras turn on. 2) We customize our product and process to meet your needs. 3) Our combined backgrounds include teaching, journalism, technical cinematography, lighting, sound, editing, and art. 4) We take our process one step further and offer an online platform to host your finished product. Food, Cooking, Fine Art, Fiber Art, Personal Development, Quilting, Life Coaching, Hospitality, Business, Startups, Technology, Education, Yoga. Wondering what it's like to film with us? View our webinar for the inside story. 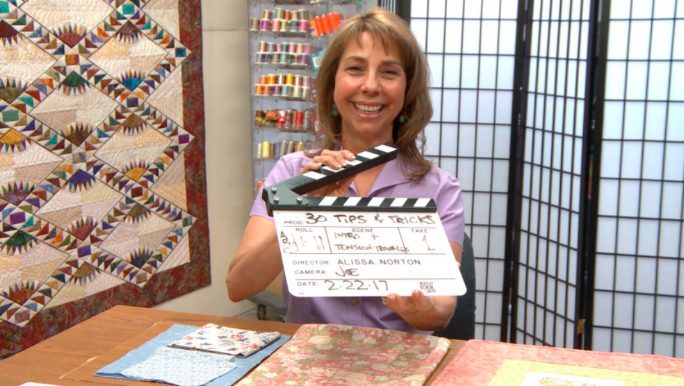 Cindy Seitz-Krug, instructor of 30 Tips & Tricks for Better Machine Quilting, hamming it up on set! Create a beautiful online class or program that you can sell yourself! Earn 100% of your proceeds. You'll control your price point. We offer an online hosting platform that can be included as part of our package. We helped Boulder startup Canvas Technology raise funds through an investor video shown in Silicon Valley. Our client Brent LaGrange needed a video to explain his muscle activation services to prospective clients. It saves him a lot of time every week in his business.